Doesn't it seem that too often we don't reward ourselves? I know, for myself, that I always feel a sense of guilt if I splurge on something special, or buy something that I know I shouldn't, or even eat something that isn't necessarily healthy. I beat myself up over these things and even am to the point where I sometimes feel that I don't deserve my splurges. I scold myself for "rewarding" myself. It wasn't until recently that I realized how unhealthy not splurging is. If I tell myself that I can't have a hamburger or a donut, I'll end up binging out on ice cream. If I tell myself that I'm not worth a pedicure twice a month then I feel like I can't spend my hard earned money on two days a month of pampering myself. If I don't allow myself to buy things for my new apartment, then I always come to home to an empty house, which makes me feel depressed. Now don't get me wrong, I"m not saying that I'm gonna run out and buy a brand new car just because I've been wanting one for a few years and fell like I deserve it. I think there are smart ways to splurge on yourself to keep you from getting stuck in a rut. I also think that the occasional smart splurge can take you to a higher place, mentally. For example, when I'm able to eat the finest food in my little one bedroom, 812 sq ft apartment, it takes me somewhere else mentally. I can picture myself sitting at a fine dinning restaurant, surrounded by first class people. It's incredible to be able to bring that sense of "high class" home with you. That's exactly the feeling I got with this week's TWD recipe. I have always thought of Creme Brulee as something very fancy, hard time make and only worthy to touch the lips of people who have a lot of money. I don't know where this impression came from, but I'm sure My Best Friend's Wedding didn't help my thoughts of Creme Brulee. 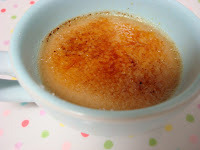 And I had my doubts when Mari of Mevrouw Cupcakes chose Dorie's Creme Brulee. But I was amazed to find out how easy the recipe actually is. I wanted to kick my Creme Brulee up a notch, since plain Creme Brulee just wasn't fancy enough, so I steeped some Chai Tea bags into my milk, and added cinnamon to my egg mixture. Within five minutes I had completed my Creme Brulee batter! It was just that simple. The result was amazing! Very creamy and exotic tasting, yet comforting to the soul. Which taught me one thing. I don't have to be high class or non-splurgant to enjoy in life's riches! I felt the same way about creme brulee - it's for the restaurant! But now we can make it at home!!! 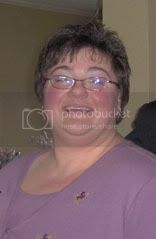 :) Yours look great!! I'm glad you found the recipe to be quite simple - it's not as hoity-toity" as it seems!! The chai flavor sounds really yummy! what a lovely essay on splurging, and you are so so right. your creme brulee looks wonderful! 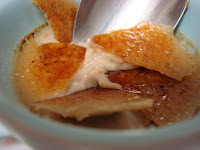 Chai crème brûlée sounds fabulous! Very creative, well done! I agree with your opinion on splurging. A little every once in a while makes everyone happier than just skimping all the time. I love the idea of chai flavoring for this too. I am so with you on the splurging thing. I love your thoughts on splurging and you are ABSOLUTELY right! I love the innovation you took with your brulee and it looks gorgeous! an occasional splurge is a necessity! 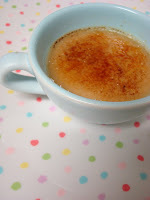 :) your creme brulee-in-a-cup looks adorable, great job!